In November 2018 we spend three weeks not far from Tarragona. After having crossed the mountains of the Maestrazgo with Perucho in mind, I now continue with Morella, also with Perucho in mind. Let us quickly recapitulate, what happened in the Maestrazgo and in Morella in Perucho’s novel “Las historias naturales”(see separate blog): In 1840, during the first Carlist War, the protagonist, liberal Antonio de Montpalau traverses the mountains of the Maestrazgo in search of the vampire, alias El Mochuelo, alias Onofro de Dip de Pratdip. Montpalau and his followers are captured by the conservative Carlist troups and taken to Morella, where the general of the Carlists, Ramón Cabrera, has his headquarter. Cabrera had been bitten by the vampire. Later Cabrera with his troups leaves Morella for Berga, where Montpalau will help Cabrera escape from the gloomy fate of becoming a vampire. We descend from Port de Torre Miró. 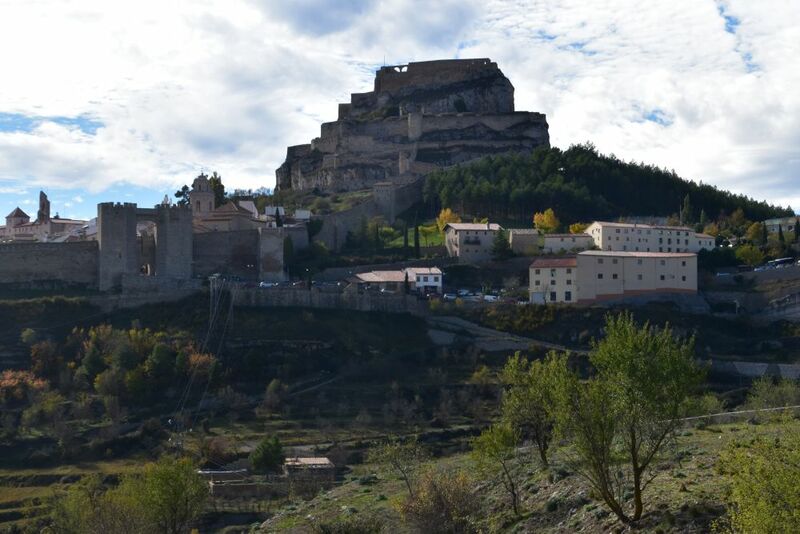 Approaching Morella from the north, we see the medieval city towered by the castle. Actually, the whole City, with the walls surrounding it, might be part of the castle. It looks like the nest of an eagle, as Perucho writes: “el escarpado nido de águilas realista” (p. 172, at that time occupied by the royal (realista) Carlists). 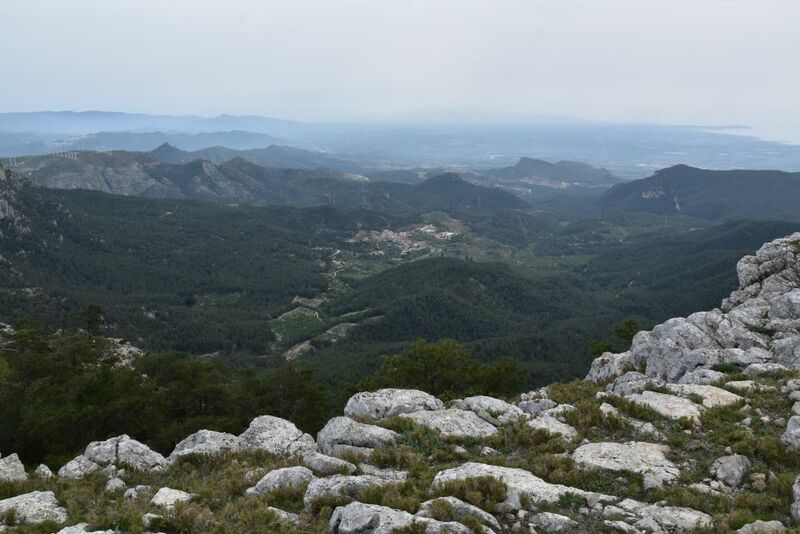 Like Perucho, I could imagine King Arthur having resided here (p.181): “Llegando por la carretera de Monroyo…, uno cree estar ante de una de aquellas ciudades del Rey Arturo y de los caballeros de la Tabla Redonda, adecuadísima para albergar el Santo Grial”. (Arriving on the road from Monroyo…, one thinks to stand in front of one of those cities of King Arthur and His Knights of the Round Table, well suited to keep the Holy Grail). 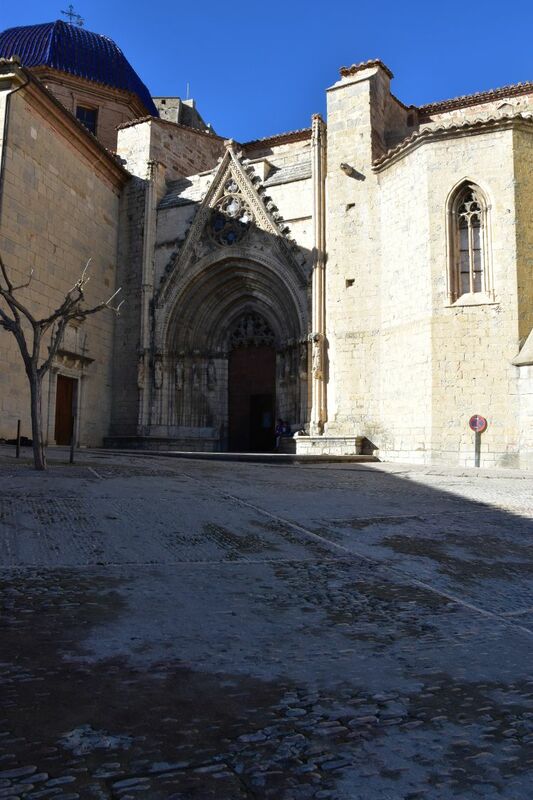 Furthermore, Perucho compares Morella to Mont Saint Michel in France, just without the sea around it. 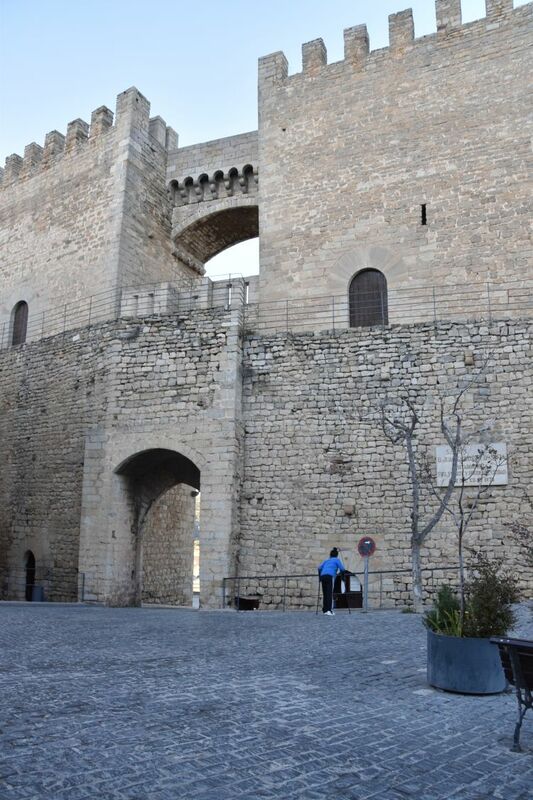 We park our car along the town wall and stroll through the narrow, cobbled streets. “Morella tiene mucho carácter,” Perucho says (p. 178, Morella has much character). It was an important city connecting the Ebro valley and the coastal planes around Valencia. The strategic position of Morella is reflected in numerous palaces. The palace of the Cardinal Ram (built in the 15th century) is now a hotel. Another Gothic palace has belonged to the Marquès de Cruilles. 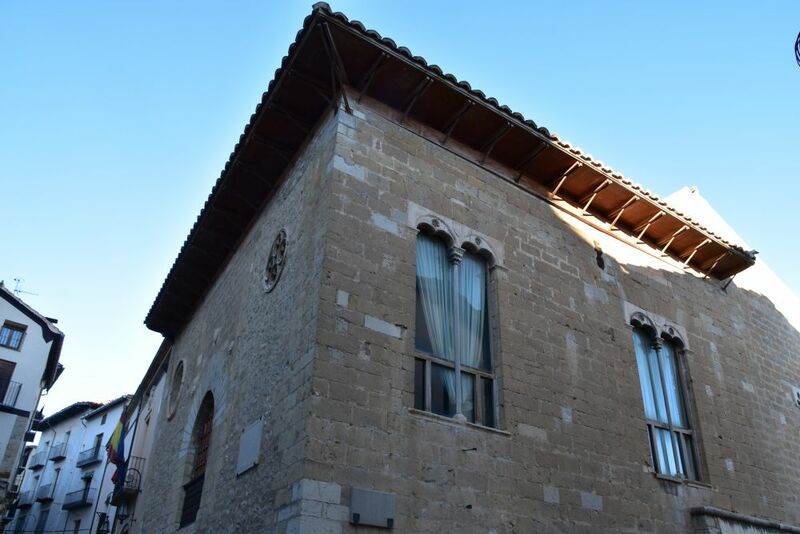 Next door is the Casa Rovira. 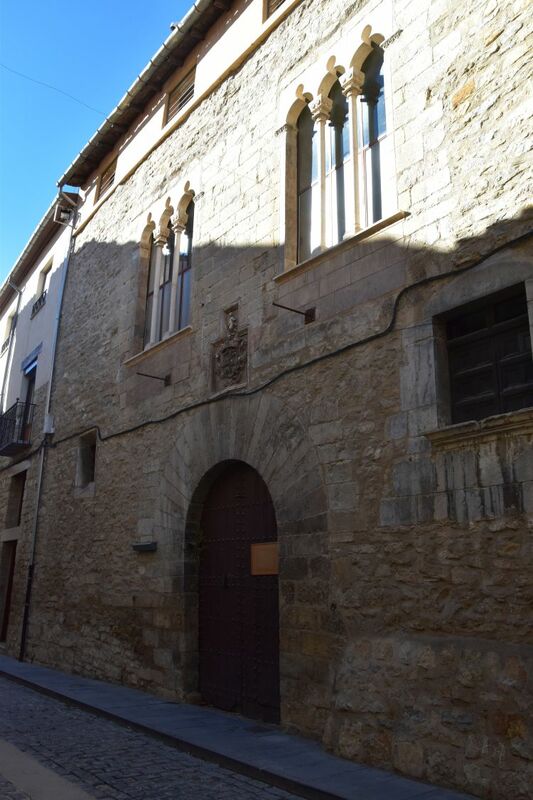 In 1414, Vincent Ferrer, a famous Dominican friar and preacher from Valencia, stayed in this house on his way to meet the antipope Benedict XIII and the Spanish king Ferdinand I (Vincent wanted to convince the antipope to abdicate, in which he did not succeed). The hosts of the Casa Rovira agreed that for Vincent they would prepare a meal made out of the best they owned which was their son. When being served the meal, Vincent understood, what had happened, did not eat, but revived the son successfully – the boy now lacked only one finger, because the mother had tried the meal before serving it. Vincent Ferrer later became Sant Vincent. Legend mixed with reality, explained on these ceramic tiles. Now I look forward to seeing the famous apostle portal of the Gothic church Santa Maria La Mayor (built around 1300). Here it is, hidden because of renovation. Bad luck. Next to it, the virgin’s gate is still waiting for renovation. Perucho’s description of this church is very much to the point (p. 182): “La cathedral es una joya de piedra profusamente esculpida y con un coro construido de manera ingeniosa, en medio de la nave” (the cathedral is a jewel made out of stone lavishly sculptured and with a choir constructed in an ingenious manner, in the middle of the nave). 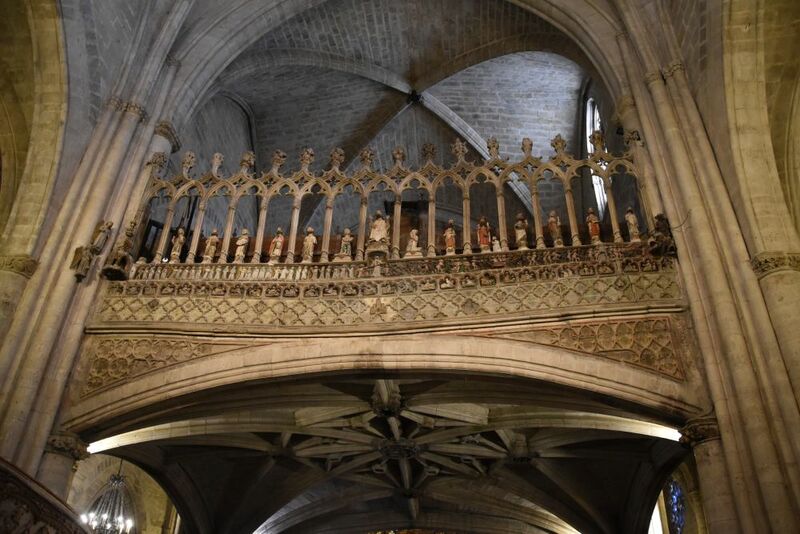 This is the ingeniously constructed choir elevated in the middle of the nave and decorated with the representation of the Last Judgment. 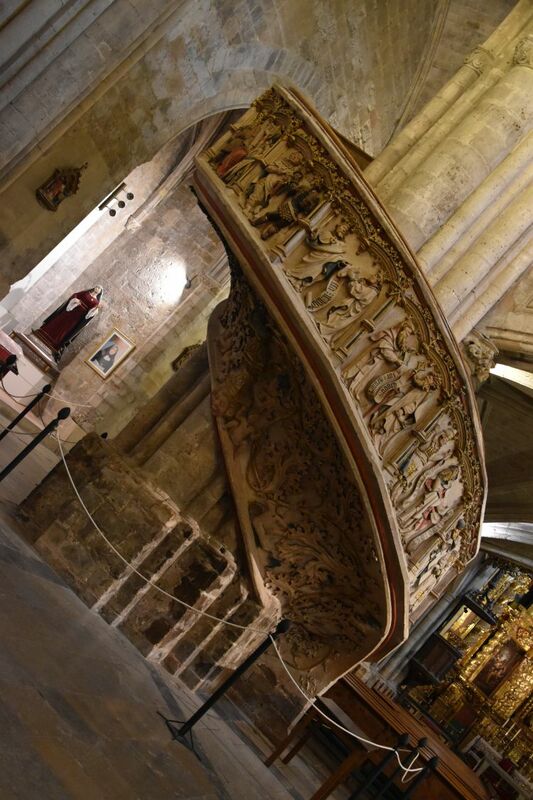 Spiral stairs with magnificent sculptures explaining the life of Jesus are leading up to the Choir. Above the cathedral we buy tickets for the Convento de San Francesc, now in ruins. 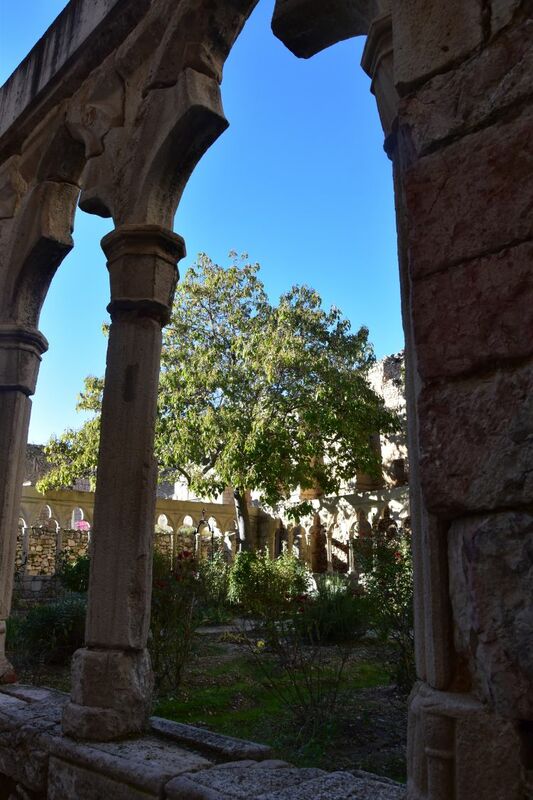 This is the Gothic cloister. We admire the Danse Macabre. Every one will be the victim of godfather death – and they are all sitting on this tree. 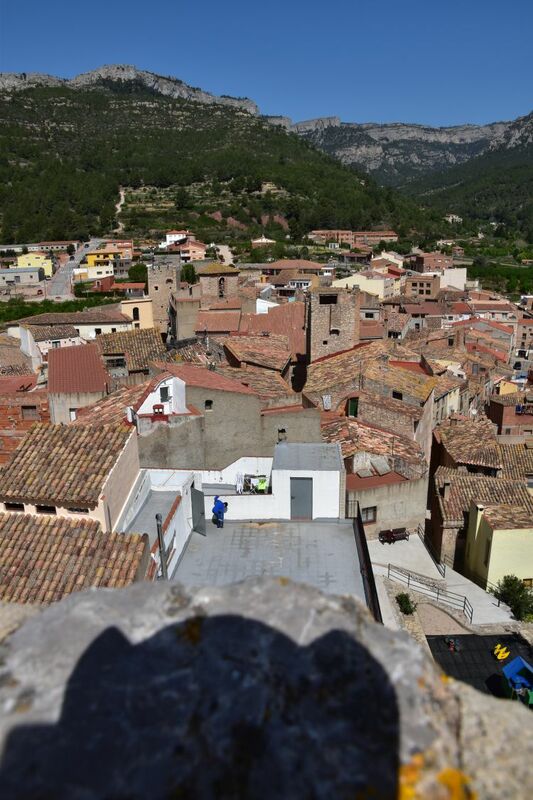 High above the Convento San Francesc is the castle. The access is in the cloister. This is the castle seen through one of the arches of the cloister. “Who is this man?” a family father asks, “ah, hm, Ramón Cabrera, okay”, and he makes selfies of Cabrera with his children and his wife. 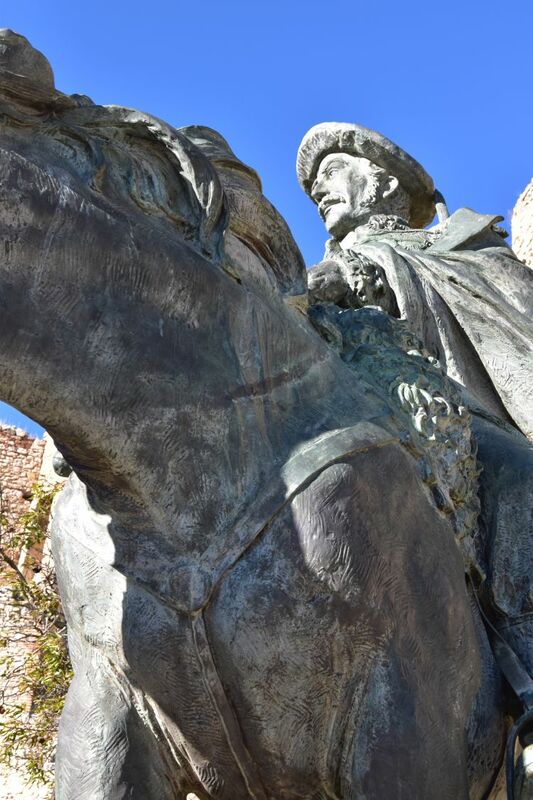 Yes, Ramón Cabrera, the Carlist leader, has the honour to greet visitors of the castle still today. The castle was his headquarter in the First Carlist War. Cabrera had the title “Count of Morella” and his surname was “the Tiger of the Maestrazgo”. From the top of the castle I enjoy the gorgeous view. It is almost impossible to approach Morella without being noticed from here. And with the clever system of defensive walls protecting the castle on top of the steep rock, it seems almost unconquerable. I can well imagine, how Cabrera and Montpalau sat on one of the terraces of the castle and had a coffee, with the magic view of the stone city at their feet: “Una tarde, mientras tomaban un café en una de las terrazas del castillo, con el mágico visto de la ciudad de piedras a sus pies, …” (p. 183). 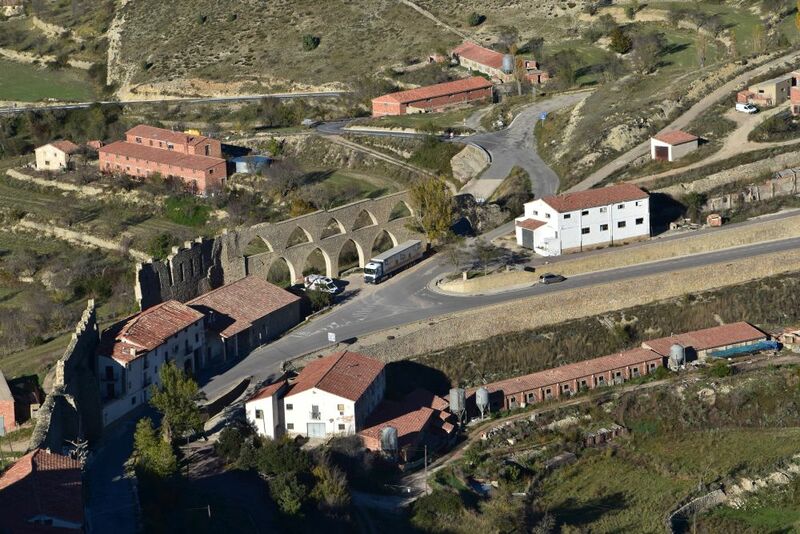 Not much later after that coffee break, Cabrera left Morella with most of his troops to retreat north to Berga. They did so early in the morning. 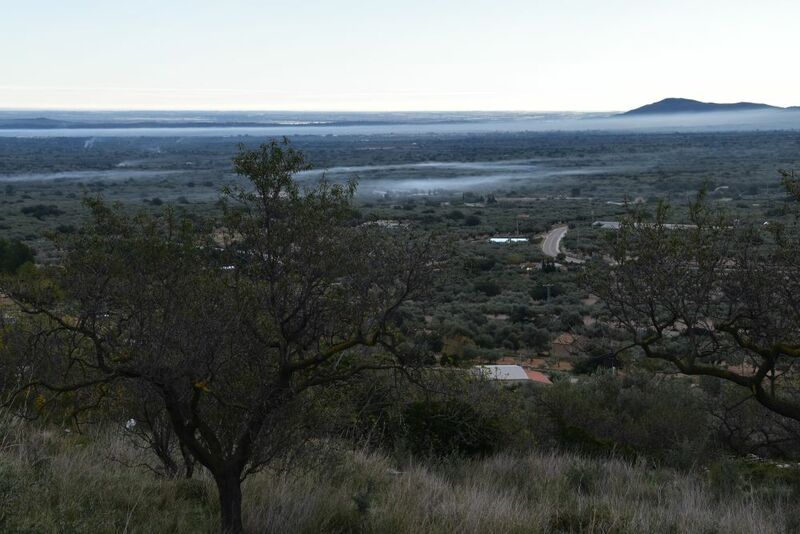 It was very cold then and they intended to reach the warmer Ebro valley as quickly as possible. “Cabrera y el ejército emprendieron la marcha al rayar el alba. Hacía un frío que pelaba, y la tropa… llevaba tapabocas. El Maestrazgo era una región terrible y necesitaban llegar a la cálida ribereña lo más pronto posible.” (p. 190). My guidebook says that temperatures in winter can feel as low as minus 20 degrees centogrades, as wind and frost are cumulating. 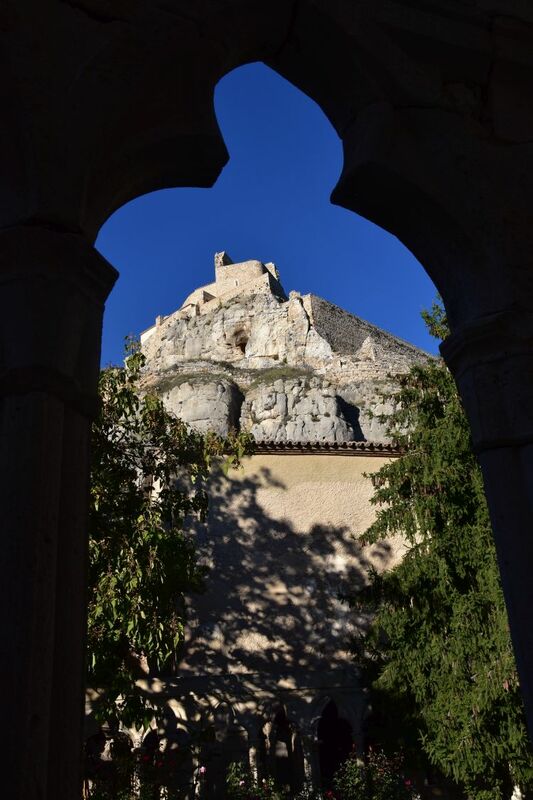 Soon after Cabrera had left Morella, Baldomero Espartero (who fought for the cause of Queen Isabel II) conquered the castle and elevated the conservative flag of the Queen on the castle. Zooming I can see the medieval aqueduct from the 14th century that up to the 19th century provided Morella with water from the near mountains. I believe that I see a ditch behind the aqueduct. Now I understand, what Prince Lichnowsky experienced here, as described by Perucho. Lichnowsky was a nobleman from the Prussian Army that fought for the Carlists and Ramón Cabrera in the First Carlist War. Lichnowsky did not know that Espartero had taken over Morella in the meantime. He wanted to warn Cabrera of spies believing that Cabrera still resided in Morella. Lichnowsky approached the gate near the aqueduct. He noticed that he was received in a hostile manner. He retreated to one of the arches of the aqueduct. From here, he looked up and noticed the enemy’s flag wave on the castle. He understood, Espartero has conquered Morella and he, Lichnowsky, has to escape. He turned around, crossed the ditch to his right and disappeared towards Catalonia. 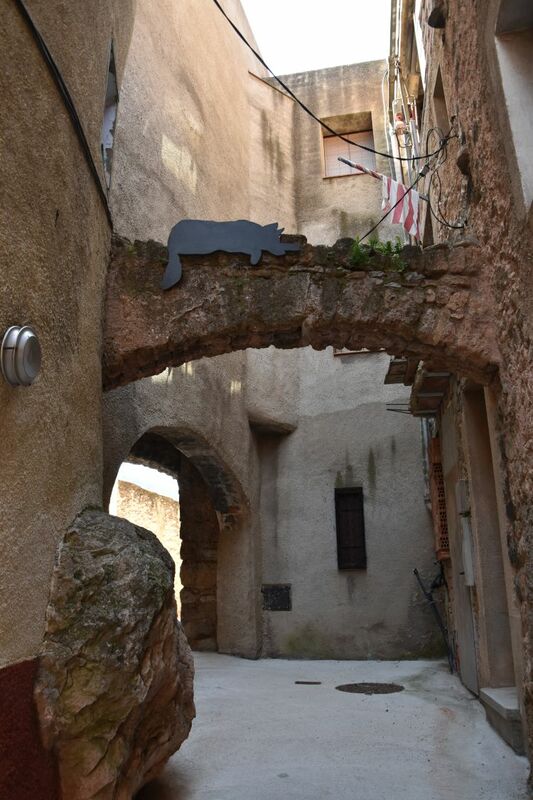 (“El príncipe Lichnowsky… montó al caballo… y, a trote ligero, se dirigió a Morella… después de pasar bajo un arco del acueducto, llevaba, derecho, a la maciza puerta fortificida… Súbitamente vio como saltaban minúsculas salpicaduras de tierra a su alrededor… Oía las detonaciones agrias, … hacía dar la vuelta a su caballo. Encontró protección de uno de los pilares del acueducto, mientras una bala rebotaba contra la piedra, a un palmo de su cabeza. Entonces con mucho cuidado, miró hacia arriba. En la torre del castillo ondeaba la bandera de la reina… ¡Dio mío! Qué había pasado?… Lo urgente era escapar,… A la derecha se abría una barranca medio cubierto con matas de brezo florido. Espoleó a su caballo. El salto fue a la desesperada, cerrando los ojos y mientras sentía a la Muerte a su espalda… El Principe huía como un gamo hacia tierras de Catalunña…” (p. 229)). This is the gate closest to the aqueduct (seen from inside the city) that gave the unfriendly welcome to the Prince Lichnowsky. 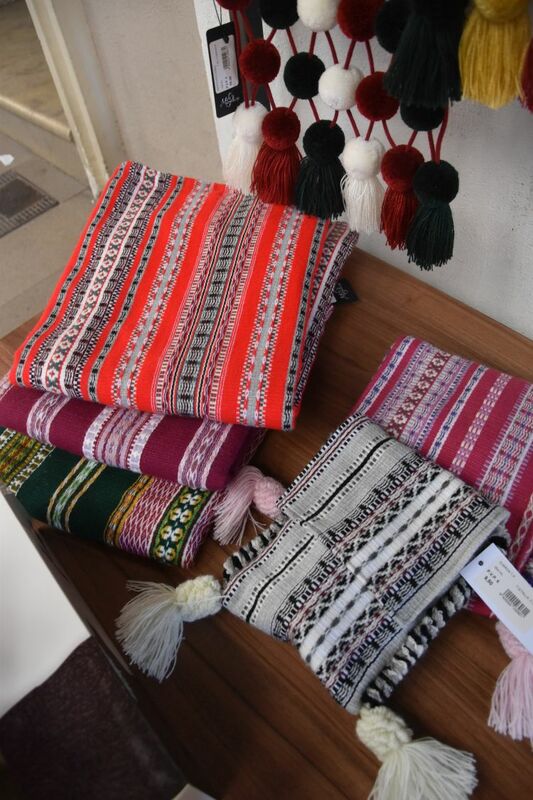 … and evaluate the woven blankets with the typical pattern of Morella. All blankets that we looked at, were made out of synthetic fiber containing some 10 or 20% of pure wool. Not what we had expected. We buy some sweet specialties instead, flaons and mantecados. We stop at the beautiful townhall dating from the 15th century. Inside the courtyard we find some giants (used at Corpus Christi) and a film of the Sexenni that the town celebrates every six years to commemorate the end of the plague in 1672. We return to the town wall to pick up our car. We notice a heavy fine behind our wiper for having parked where only those authorised are allowed to, not foreigners like us. On this busy Saturday with many cars parked all over, we had not noticed the prohibition sign… but we find it okay to leave some money to support the ongoing renovation in this charming town. In the evening we unpack our souvenirs, the flaons and the mantecados. The sweets accompany our afternoon coffee times. 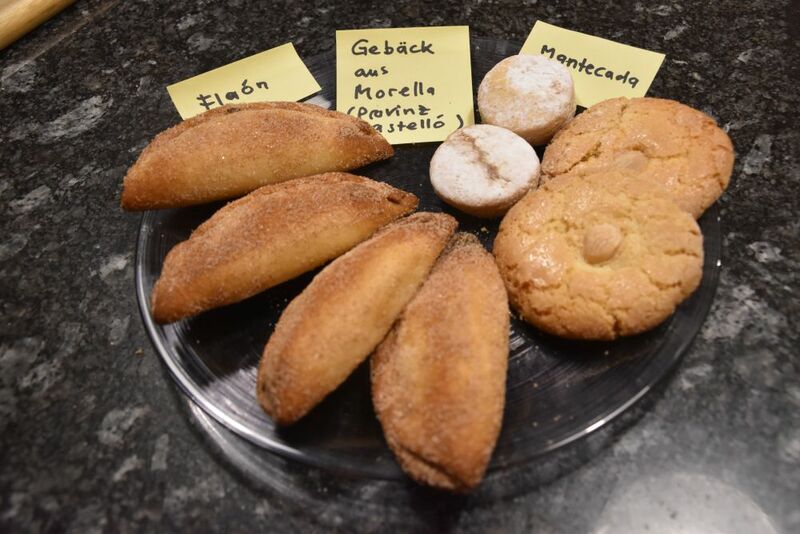 From our selection of sweets, our favourites the larger mantecados with the almond in the middle. 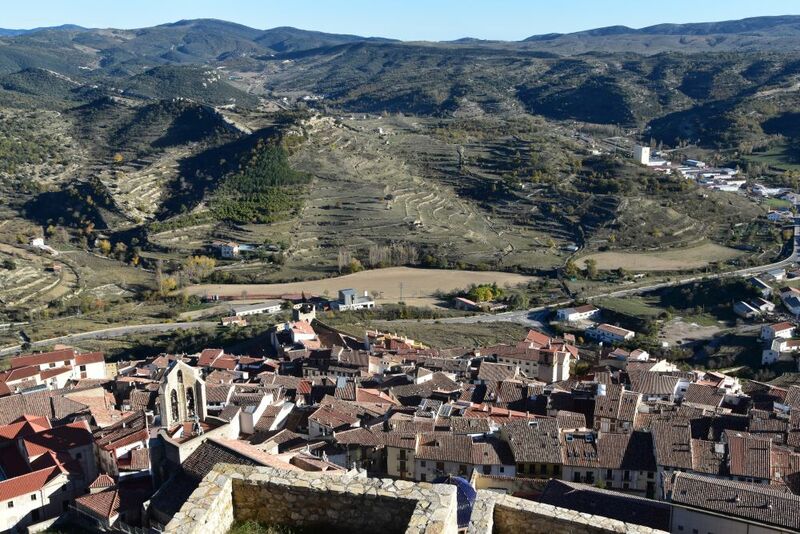 Yes, Morella is worth a visit. David Navarro: “Morello”, Reihe Tourismus Spanien, Fisa Escudo de Oro. Juan Perucho: “Las Historias Naturales”, Hurope, Barcelona 2003. Having read “Las historias naturales” by Juan Perucho, I wanted to cross the mountains of the Maestrazgo and visit Morella. 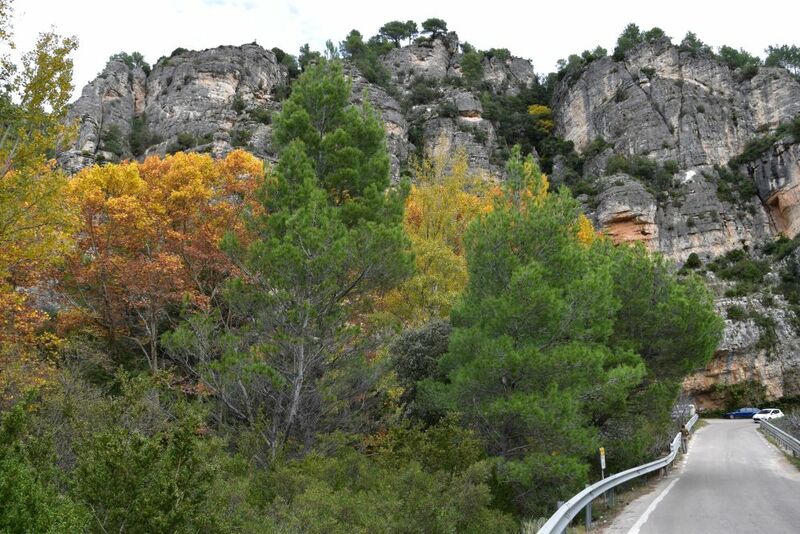 Now, let us follow the tracks of Perucho and Montpalau by crossing the Maestrazgo on the way to Morella. Montpalau crossed the Maestrazgo mountains coming from Horta San Juan and Valderrobres (just outside the map above, see the dotted red line). 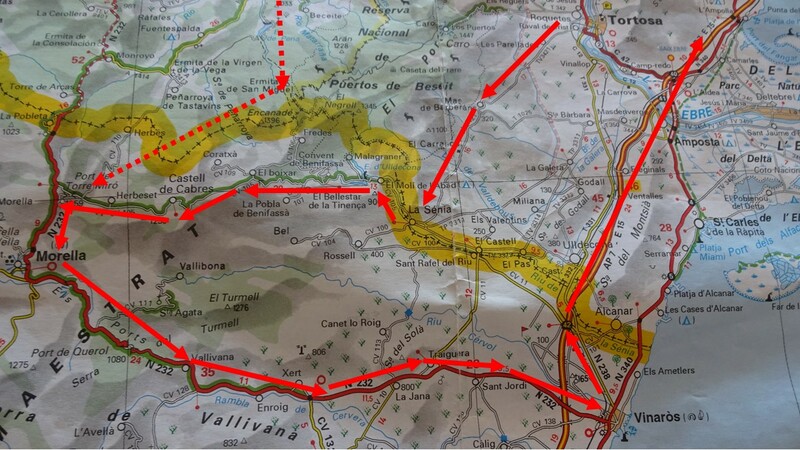 We traversed them farther south starting at Tortosa (continuous red line leading to Morella). 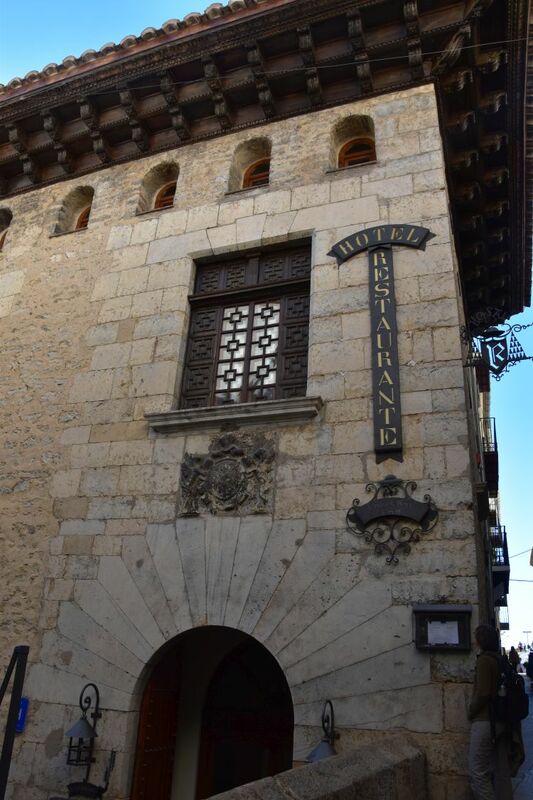 This is, how Montpalau approached the Maestrazgo (p. 164): “En Horta de San Juan visitaron la plaza gótica porticada y el Convento de San Salvador… el aire era muy frío y tuvieron que abrocharse hasta el último botón de la levita. El paisaje había cambiado ahora; salvaje, grandioso y como telón de fondo, las altas montañas del Maestrazgo.” (In Horta de San Juan we visited the gothic main square and the monastery San Salvador… the air was very cold and they had to close their frock coats up to the last button. The landscape has now changed; wild and grand and with, in the background, the high mountains of the Maestrazgo). 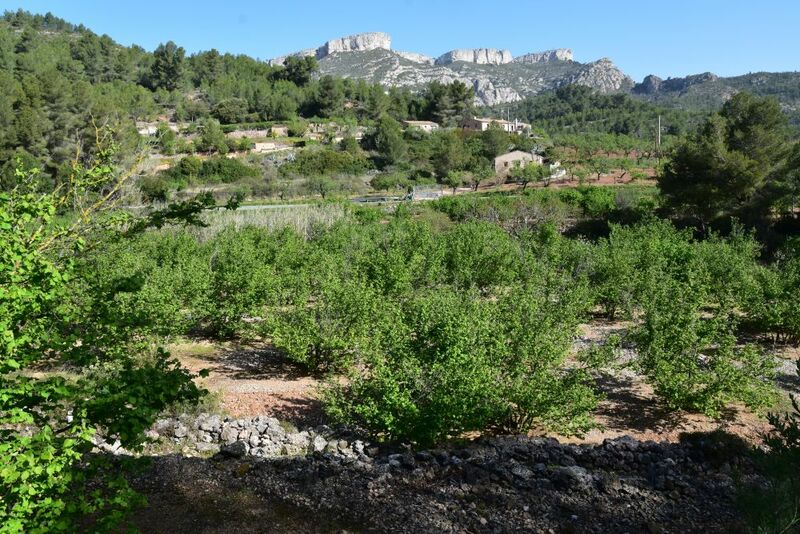 We, however, ascend to the Maestrazgo mountains via Más de Barbera where we have a wonderful view of the Montsia mountains and of the Galera plane with its utterly tidy olive groves. We take a coffee in the Lo Racò that would make a good stop for eating, recommended in Tripadvisor. Nearby we find a signboard that lays out enticing hiking paths. 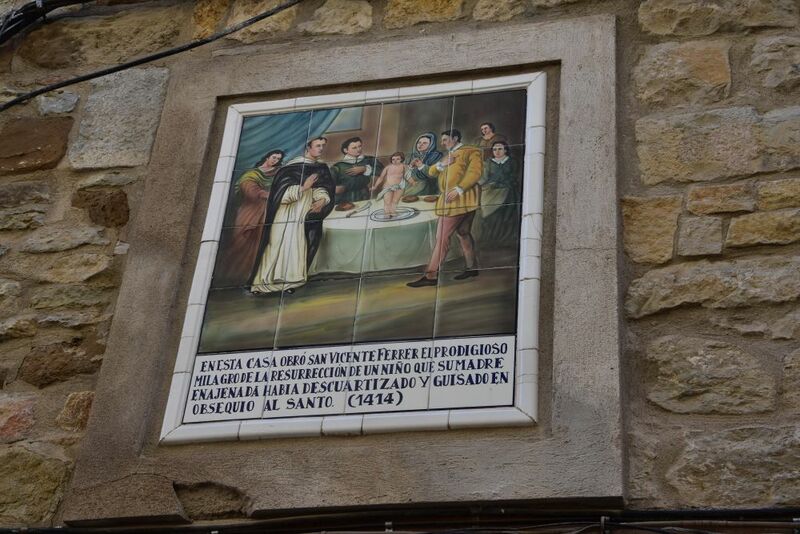 We continue ascending to the village La Senia where we reach the Maestrazgo mountains. The road becomes narrow curving through wild rocks. 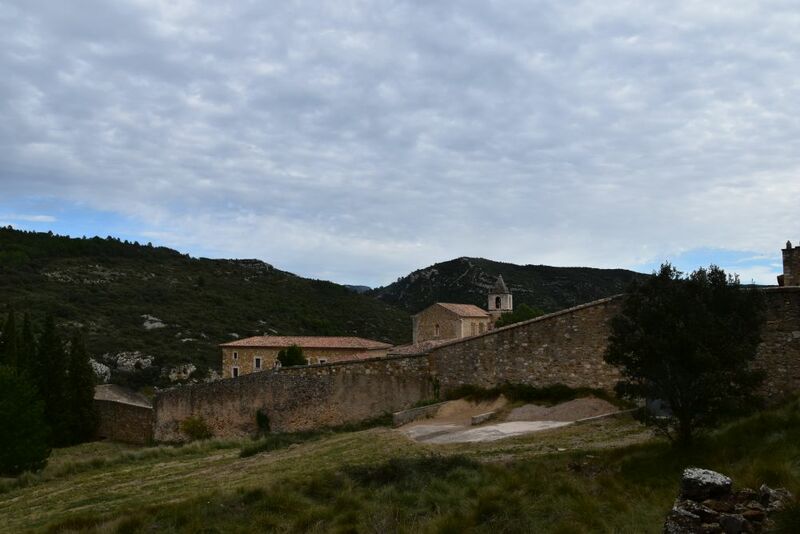 The Cistercian monastery Benifassà is closed and opens on Thursdays from one to three p.m., just two hours per week, not more. Very secluded. 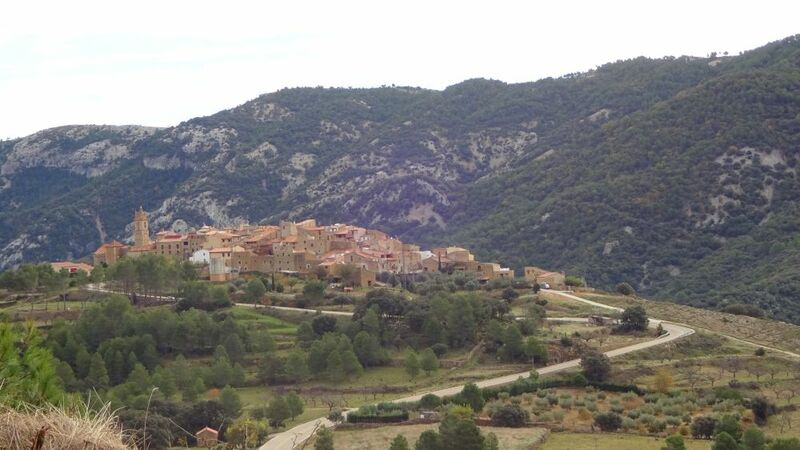 The village of Benifassà looks like an aery – a nest for eagles – in a barren landscape. The road winds up and down along a rocky mountain ridge. We are on about 1000m above sea level. We agree with Perucho and Montpalau (p. 165) “Era un paisaje de maravilla. A media que se ascendían se renovaba el aire, se hacía más puro, y un perfume salvaje de bosque y de animal en libertad se mezclaban curiosamente… Pasaron por debajo de grandes cascadas de agua ensorcedoras…; descubrieron cuevas… enormes… En verdad, el Maestrazgo era una tierra muy extraña y sorprendente…” (It was a marvellous landscape. As they climbed higher and higher, the air refreshed, became more pristine, and a perfume of wild forest and animal in freedom mixed up strangely… they passed under large and ear-deafening waterfalls; they discovered big caves… as a matter of fact the Maestrazgo was a strange and surprising area). We reach a barren high plateau with some lonely farms dispersed on meagre meadows. Ever once in a while we see some cows, some sheep, some goats. We are alone here – like Montpalau and his friends in Perucho’s novel (p. 165): “Desde que se hallaban en el Maestrazgo no habían visto a nadie. Se acercaba el puesto del sol. Vieron una masía, medio abandonada… Decidieron de pasar la noche en la triste masía… “ (Since they had arrived in the Maestrazgo, they had not seen anyone. The sun was about to set. They saw a farm, half abandoned… They decided to stay in the desolate farm for the night…). The next day, Montpalau and his followers succeeded to escape giant fleas that were attacking them… their weapons were branches of pine trees that they ignited and carried like torches. Very fancy… but perhaps… why not… I could almost imagine giant fleas jumping around us in this wild landscape and if they came, thanks to Montpalau, I would know, how to fight them – with ignited branches of pine trees..
After more than two hours on narrow roads, we reach the Port de Torre Miró. 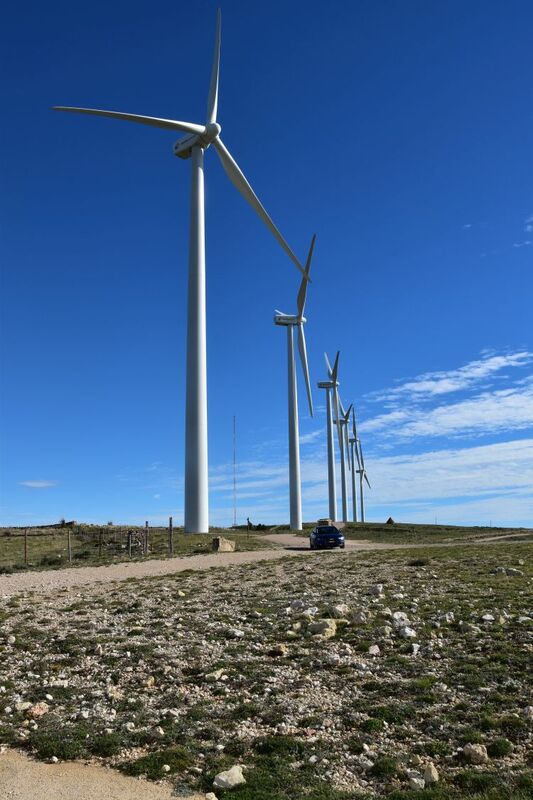 We are now above the valley of Morella and enjoy the gigantic windmills and the view together with other tourists. We are no longer alone. Mountains around us. Ursula captures them with a panoramic view. 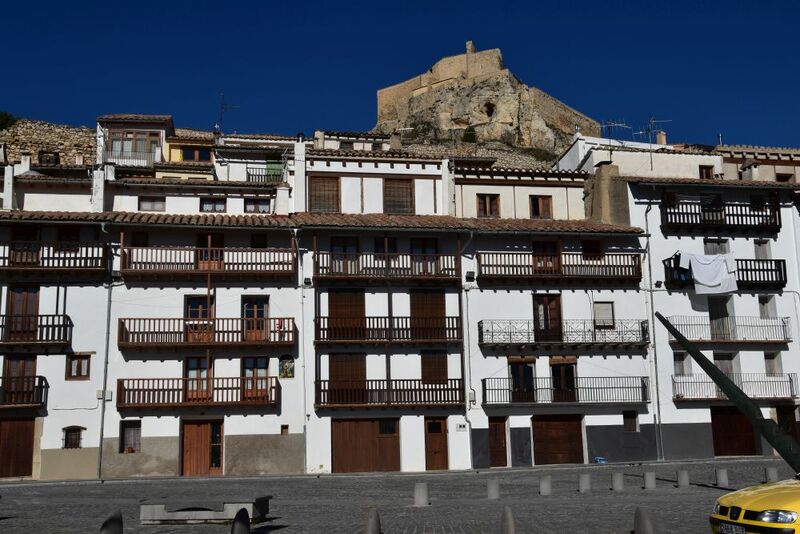 We continue our way to Morella – and I will talk about this small and fortified in my next blog. goфAgain and again we traveled to Catalonia, south of Tarragona. Again and again we noticed the sign to the village Pratdip pointing to the mountains. One day, we followed them and we found Dip and Joan Perucho’s novel „natural history“ or in Spanish “las historias naturales”. Let me tell you more about Pratdip and its vampire Dip. 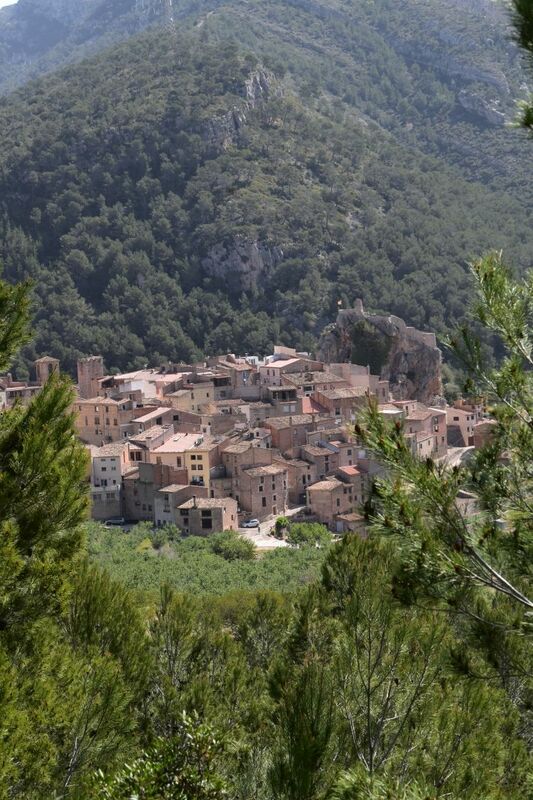 Pratdip is located in the mountains of Llaberia, some 40km southwest of Tarragona. Narrow steep streets are overseen by the ruins of their castle that sits on a steep rock. 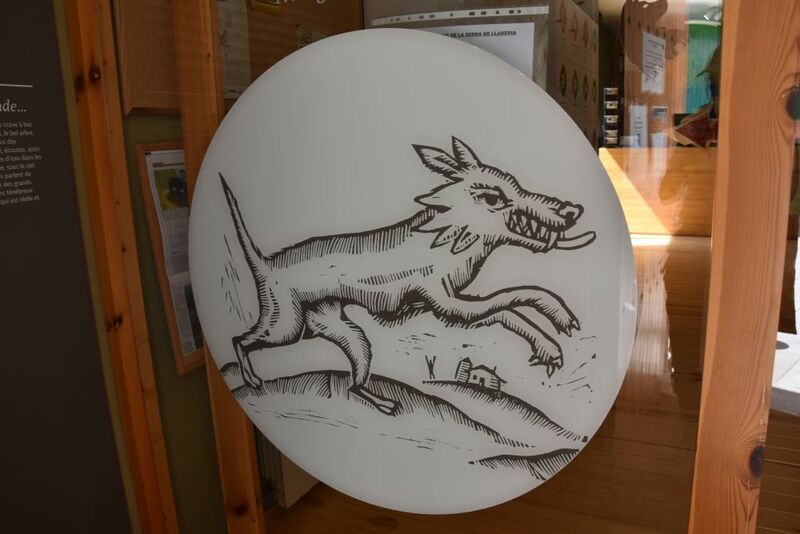 In the village there are various portraits of the vampire Dip in his incarnation as a dog-vampire (vampires can change their appearances rapidly). When we enter the tourist office, we find another dip. 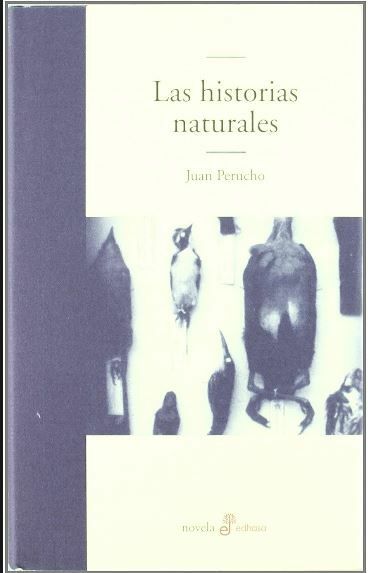 The assistant laughs: „You are looking for the vampire Dip“, she asks and proudly shows us the book of Joan Perucho with the title „Las historias naturales“. She adds: „Perucho tells you everything about the Dip and what he has done to Pratdip.“ The original version of the novel is in Catalan. I buy the Spanish version. … where we find a friendly restaurant. To round our excursion up, we climb the castle rock and enjoy the view. Back at home I read the novel of Joan Perucho. In his normal life, Perucho was a serious judge. When writing his „historias naturales“ or „natural history“, he must have twinkled with his eyes. The novel can be located somewhere between fable and reality and is full of humor. I could find five threads of interlaced actions. First the novel is about the vampire Dip – his full name is Onofro de Dip. In the 13th century, he had owned the „meadows“ around Pratdip (hence the “prats of dip”). He traveled to Hungary to prepare the marriage for his king James I with Yolanda (or Violant) of Hungary (James and Violant are a historical fact). On the way to Hungary, Onofro de Dip fell in love with the lady vampire Meczyr who turned him into a vampire and „Non-Dead“ (No Muerto). He returned to Pratdip in the early 19th century and terrorized the village killing inhabitants every night. The current owner of Pratdip, Baroness Urpí, asks her brother, Marqués de La Gralla, for help (Gralla is a „real“ noble family from Barcelona; they owned a palace that no longer exists today). A friend of the Marqués de Gralla, the young natural scientist Antonio de Montpalau (an invented person), travels to Pratdip, neutralizes the vampire with the help of garlic, parsley and wooden crosses. Then he finds Dip’s grave in the castle and expulses Dip from Pratdip. Onofro de Dip morphs into the solo guerillero El Mochuelo (the Owl) fighting for the (conservative) Carlists and terrorizing the region of Tortosa and Berga. Montpalau pursues him, finds him finally in a crypta near Berga (castle Mataplana) and by speaking out some magic words, Montpalau makes Onofro de Dip die „properly“ and find his peace. Second the novel is the portrait of the higher society of the Barcelona area in the early 19th century. Montpalau as a young scientist belongs to that higher society. The members of the high society enjoy meeting in the Gralla palace, eating and discussing history, natural science, mathematics or music. As a reader you feel the luxury and shake your head about the sometimes detached, elitist or even absurd discussions. Once Frédéric Chopin and George Sand are invited to a banquet, as they stop over in Barcelona. Antonio de Montpalau is a scientist who is focused on classifying animals and plants aorund him. He is also interested in geography and geology. Before going to Pratdip, he researches all literature available and he finds scientific literature about vampires that recommends using garlic, parsley, portulak, wooden crosses and mirrors to fight vampires (I can feel Perucho smile, when he lets Montpalau buy ten dozens of mirrors before leaving for Pratdip). Third the novel has a historical background: The year 1840 in the first Carlist War in which the male pretendent of the throne, Carl V, fought against his niece, the actual Queen Isabel II. One one hand, the Carlists that fought for Carl V, were conservative. Their target was a federation of several states unified by the king of Spain and the catholic church as the only two common denominators of the federation, conserving, what Spain had been before. A man made constitution was not needed in their eyes. Federation was, of course, welcomed by Catalonia (or also the Basque region). Carlists were strong in Catalonia. On the other hand, the followers of the actual Queen Isabel II were classified as liberal, as they based their ideas on the French Revolution. The wanted the separation of church and state, a centralized state based on the constitution (as set up in 1812, like France). The idea of the centralized state was not, what Catalonia strived for, but the high society in Barcelona, including Antonio de Montpalau, was liberal. Some real persons give a realistic background, the most important being Ramón Cabrera. He was the outstanding leader of the conservative Carlists in Catalonia. His liberal (pro Isabel) opponent was Baldomero Espartero. In 1840, Espartero defeated Cabrera and his Carlists in Berga not far from the Pyrenees. Montpalau and Onofro de Dip interact with the real persons. Ramón Cabrera has been photographed wearing a large scarf around the collar of his shirt. Furthermore he has been reported to feel ill, when trying to conquer Gandesa. Perucho tells us the reason. Cabrera attacked Gandesa at the time, when Dip morphed into the Carlist guerilla „El Mochuelo” that wanted to become a Carlist leader himself. He bit Cabrera such that he will become an immortal vampire. This is why Cabrera felt weak and this is why, he had to wear a large scarf (to hide the stitches of the vampire – twinkle). Perucho continues describing, how the liberal Antonio de Montpalau was captured by the conservative (Carlist) troups of Cabrera, how he could ease the symptoms of the bite for Cabrera and how finally Montpalau succeeded to free Cabrera from his gloomy destiny by making Onofro de Dip die properly – as described in the first thread of actions – in the crypta near Berga, just after the Carlist Cabrera had been fully defeated in Berga by the (pro Isabel) Espartero. Fourth the novel is a travel report about Catalonia in the early 19th century. Antonio de Montpalau, his nephew Novau and his coachman Amadeo travel from Barcelona via Villafranca, Reus and Falset to Pratdip. 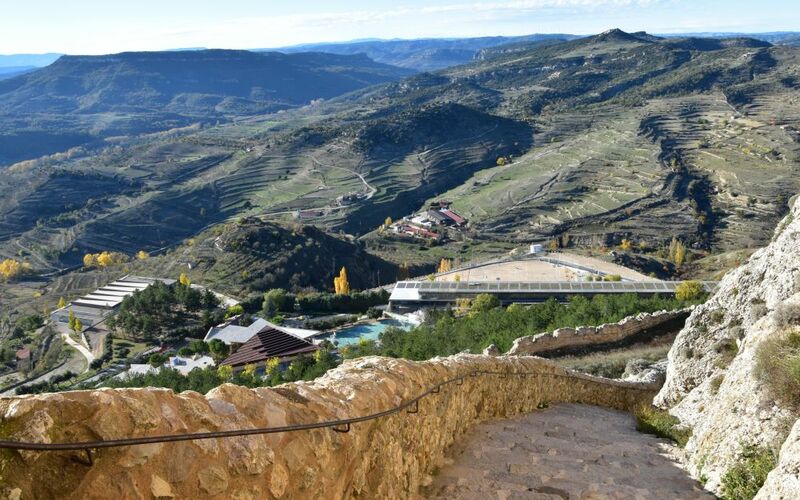 After having expulsed the vampire-Dip from Pratdip, they leave to pursue the vampire-El Mochuelo, cross the Ebro near Miravet, stay for some time in Gandesa, continue to Morella. Cabrera resides in Morella and Montpalau and his followers are captured here. Then as prisoners they accompany Cabrera to Berga. Our travelers visit places of interest on the way (e.g. 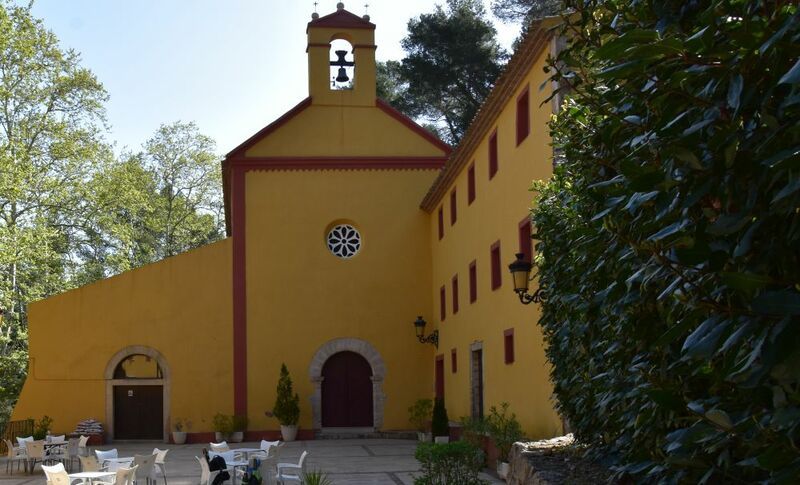 the monastery Vallbona de los Monges where the Queen Violant from Hungary has been buried), admire the beauty of the landscape, eat local specialties and drink delicious wines from Terra Alta. The travel reports are full of humor, e.g. 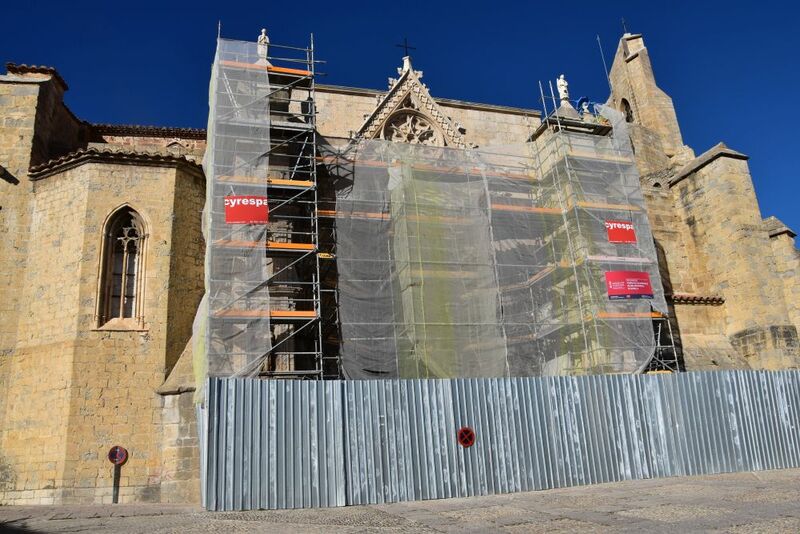 about real places of interest such as the cathedral of Tarragona that they like though their travel handbook by (real) Alexandre Laborde does not recommend to visit it. Or about less real events: The three heroes meet giant fleas, but luckily Monpalau knows, how to escape them: They inflame branches of pine trees and carry them like torches (twinkle). Fifth it is a love story with a very, very happy end. While Antonio de Montpalau is fighting the Dip in Pratdip, he and Inés fall in love. Inés is the daughter of the baroness Urpí that has asked her brother, Marqués de Gralla, for help against the Dip. Montpalau has to leave his love to pursue the Dip. 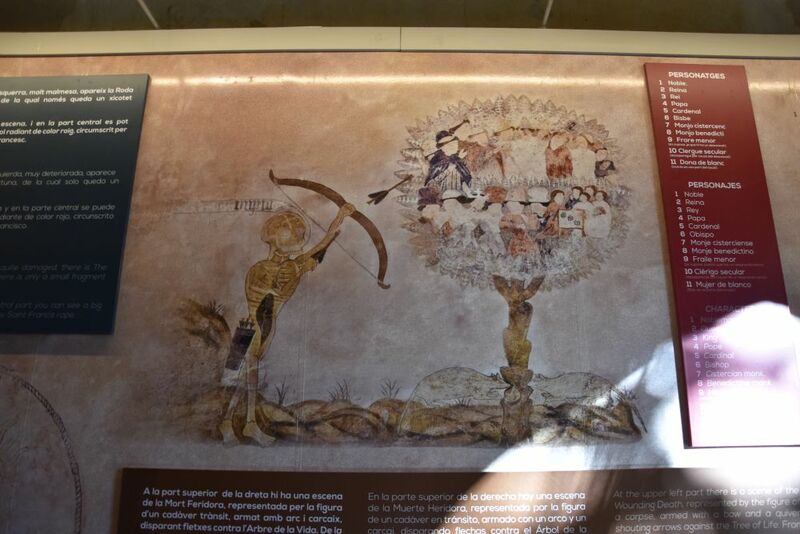 A historian has encouraged Montpalau to do so, as he found (historic-scientific) sources that reveil, it is Montpalau’s fate to defeat the Dip (twinkle). After having vanquished the vampire Dip-El Mochuelo near Berga, Montpalau returns to Barcelona. At the palace of Marqués de Gralla he finds his love Inés (the Marqués‘ niece) waiting for him. What a happy end! Perucho’s novel was the first book that I accomplished reading in Spanish. In the beginning it was a bit of a tough start for me, because Perucho takes his time to set the stage. But then, when the action of neutralizing and chasing the Dip-El Mochuelo accelerates, what a pleasure! And it was even more pleasure to go back to the start to enjoy the setting of the stage, once I understood more about the historical background. The novel is full of humor and of fantasy with links to real history and geography. I did enjoy to read about many places in Catalonia that I know and that Perucho moves to the early 19th century presenting them with the eyes of Antonio Montpalau and his followers. And I did enjoy to learn more about Spanish history which helps to understand what is going on in Spain today.